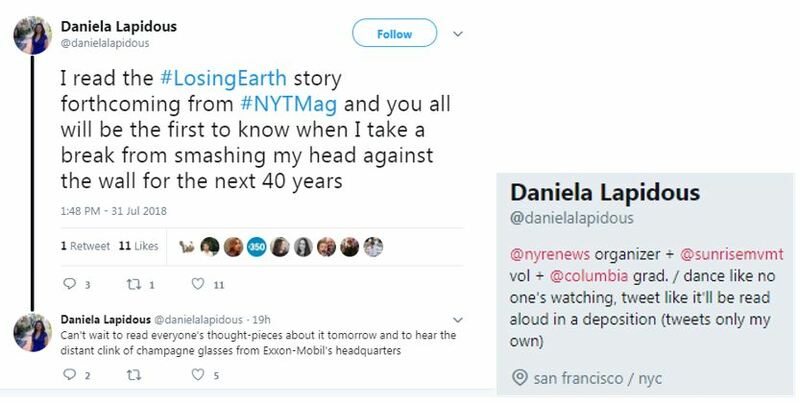 Clearly the New York Times Magazine had zero idea just how much its heavily promoted 30,000-word climate story was going to rile up environmental activists. Or did they? The response to the Times article from the climate crowd was fast and furious – and was made possible by the Times itself. As EID pointed out last week, the Times story is a crushing blow to the infamous #ExxonKnew narrative funded by wealthy anti-fossil fuel organizations: that the energy company knew the “truth” about climate change decades ago, but covered it up to mislead the public. The Times, however, destroyed that narrative by showing that #EveryoneKnew as far back as the 1970s that climate change was real and happening, but there simply was little interest among elected leaders to do anything. Activists were ready to pounce and show their deep displeasure with the story because the Times had actually provided activists the story in advance of publication. And if that’s not bad enough, top brass at the paper hosted a private dinner with activists the night before publication. If the Times was unaware of the blowback about to hit them, they certainly heard from activists that night. How do we know this? Because environmental activists couldn’t help themselves. According to news reports, New York Times magazine editor-in-chief Jake Silverstein, Times executive editor Dean Baquet and publisher A.G. Sulzberger, along with the author of the piece, Nathaniel Rich, hosted a number of activists at a swanky hotel the night before publication. Reporters with the Huffington Post, Politico, E&E News and Yale University Communications School were also guests. Minutes after the Times magazine piece went live, criticism came pouring in from the usual suspects. The debate also raged on Twitter, where activists tried to redirect people on social media to preferred outlets like InsideClimate News (bankrolled by the same foundations that fund environmental groups) and anti-oil and gas researcher Naomi Oreskes to control the message. Andrew Revkin, a reporter for National Geographic who previously wrote for the New York Times, defended Rich’s article from climate activists, noting that the very people who claim to want to solve the problem of climate change also reject nuclear energy. Revkin seems to suggest that climate activism is less about solving climate change and more about demonizing and blaming the fossil fuel industry. But it was Vox’s David Roberts who weighed in to provide some of the most valuable insight on the mass hysteria Rich’s story had elicited from the climate activist community. The result of this pressure from activists is that all climate journalism is forced to make the same points, including demonizing the fossil fuel industry, “and climate journalists sound like pod people who risk being flogged if they go off-message,” Roberts tweeted. 18. The very worst way for a journalist to spend time is joining the dogpile on literally any piece of climate content that *actually does reach a wide audience*. Here come the Very Science Messengers, on cue, explaining how this or that piece diverges from the One True Template. Fittingly, Roberts was promptly criticized by the very same people who were criticizing Rich. Not sure this is the right angle…the folks I work with, at least, aren’t asking for journalists to be activists or for the same story, we just disagree with certain takes. A story that plays down GOP and fossil fuel opposition and blames the public at large just isn’t accurate. Neither Roberts nor Rich are fans of the oil and gas industry, by any stretch of the imagination. But by daring to scrutinize the climate activist community, they earned a swift rebuke from those who should be cheering the attention these authors devoted to their cause. Is it any wonder why critics of #ExxonKnew – and the climate litigation campaign it has spawned – have expressed concerns about suppression of free speech? For a movement that constantly complains of being ignored by the media, this should have been a watershed moment. The New York Times Magazine feature story was one of the most influential articles ever written on climate change. But because the story veered from the climate activists’ orthodoxy, and did not lay blame at the True Villain, the activists opted to sabotage their own cause – and confirm the worst suspicions about the movement’s antagonism toward any dissent whatsoever.